Instead of having a power switch like all other amps (design flaw), mine will have a switched pot that switches it on and off (duh!) as well as control the loudness of the amp by varying voltages to the power amp and phase inverter. So I'll be able to get proper power section drive at any volume. To get things rolling, I present the first component of my amp, its also the only one I have at the moment. Yeeehaa! Another guitarist on the forum that decides he needs to build something because what he wants is not available in the shop. Best reason ever. Cool! Very cool... but spotted a missed opportunity to make your amp go up to 11! Gearhead wrote: Yeeehaa! Another guitarist on the forum that decides he needs to build something because what he wants is not available in the shop. Best reason ever. Cool! Jack Flash Jr wrote: Very cool... but spotted a missed opportunity to make your amp go up to 11! A friend and i are working at a similar 30w build (he's doing the gadgety bits , while i'm building the cabinet). I'm not like that. As far as I can see, there is no copyright on this amp. The schematic is freely available. See the image. I'm not going to use a circuitboard but I'm sure if you have an electronics background you can create one. I'm going to build it on turretboard (like in the old days) so I can easily modify it later. I'm ordering a kit that will provide things like the chassis, head cab, valves, retainers, sockets etc. and I'm using this schematic to build the amp (the kit is for a single channel amp). Thank you very much. Is it possible to send me a scan of the front plate, that is on your photo? This is not too difficult to build. I think the cost will go into the valves them selvs. I'll post it later, I know where I can find one but have to do it at home. RobbieZ wrote: I think the cost will go into the valves them selvs. Keep in mind that the output transformer may also cost quite a bit depending on what you get. Then there is the issue of a speaker, if you have a cab then you're fine but if you don't then you need to build/buy a combo cab and speaker or a cabinet. These options are more expensive, especially if you want good speakers. Edit: Parts are probably shipping next week I'm told. Edit: Parts arrived today! Need to go and figure out where they are, want them before tomorrow afternoon. UPS got them here in less than 2 days. Well at last I got my parts, here's the necessary picture for you people to drool over. Pretty much a heap of components now (clearly), I'll be posting regularly as I get along. A few cliff jacks and a new front plate for the head box are on the way, the guy at Valvepower said he'll send those when he gets them, thought I'd like the rest so long. Nice guy. Freakin' exciting. Can't wait to see the progress. Nice one......its alway exciting to build something yourself....the key is to exercise patience and not try to rush it. Layout, work (very much) in progress. Hopefully I can upload the file and it will keep updating itself. What sort of voicing is this ampmeant to have? The lite iib channel is more or less a straight copy of the Marshall 1974x's Normal Channel. Crunchy old school overdrive when cranked, all coming from the EL84s, no preamp drive, think early ZZ Top. 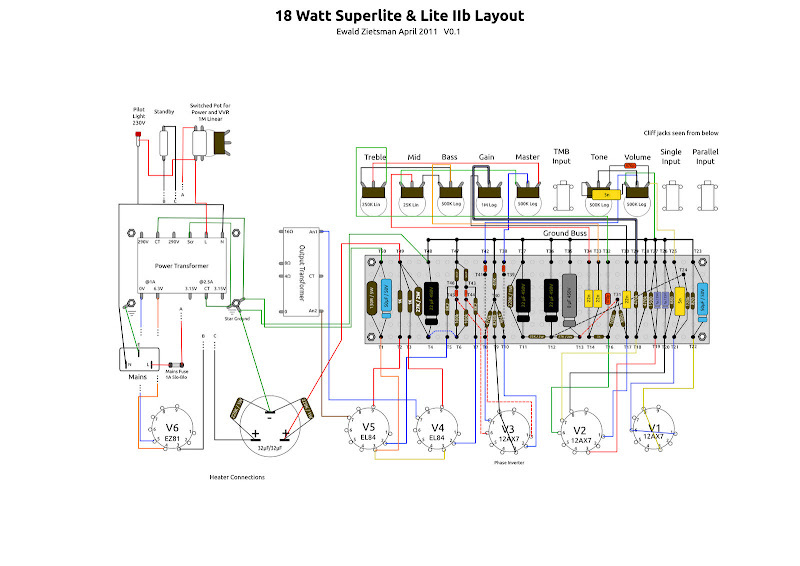 The superlite channel is more like a 70s plexi due to its increased preamp gain levels, think early AC/DC / Maiden. That sort of thing. No modern tight metal chugga's to be had here (not without some simple mods). nice.. look forward to hearing this..